I knew I’d be in for a treat when I read Time and Blood by Sherry Rentschler, as she is a gifted story teller. I wasn’t disappointed. If you like clean paranormal reads, nor will you. If you read Ms. Rentschler’s other reviews, you will find that I am a fan and have read all of her books. She is an award winning author who writes from the heart. One of her poetry books, The Book of Now, weaves a tapestry of yesterday’s history, today’s news and tomorrow’s hope. 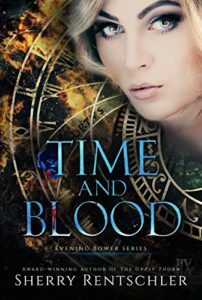 Time and Blood, the first book of her Evening Bower series is similar, but in novel form. 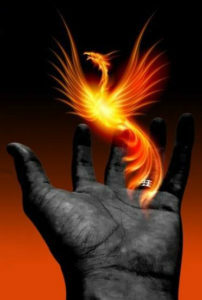 Time and Blood tells the prophecy of the Scarlet Phoenix, recorded in The Great Book of Forgetting, and the pairing of Ethyrea and Khnuman. As the story of love and the savagely murdered Khnuman unfolds, the reader wonders how Ethyrea will fulfill this prophecy older than Atlantis, because she is the last of her kind. Hmm – In What Order Should I Read the Books? I first read Midnight Assassin, a stand alone novella written to test whether readers were interested in yet another vampire series. The Gypsy Thorn is a prequel to Time and Blood. 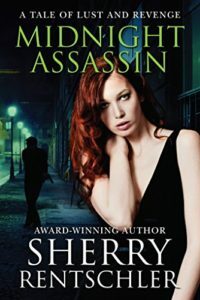 Midnight Assassin is not part of the Evening Bower series, and is not required reading. However, I like the order in which I met the characters. I recommend that you read The Gypsy Thorn prior to Time and Blood. 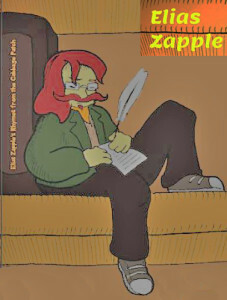 Please click the links in this paragraphs to read my respective reviews. Sherry Rentschler’s poetry has appeared online and in print. She’s a previous Assistant Editor, Amateur Poetry Journal (online), and a newspaper photojournalist. She lived in Italy, traveling around Europe, the Middle East, the Caribbean, Puerto Rico, and Greenland. 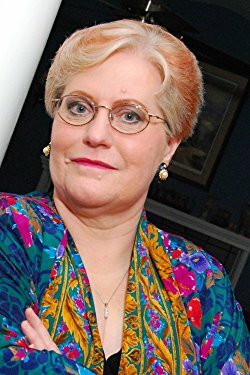 Among Sherry’s numerous awards are two 2017 National Indie Excellence Award Finalists (The Book of Now interior and poetry), 2017 eLit Book Silver Award for poetry (The Book of Now), a 2017 Indie Press Award for the cover of her non-fiction poetry, The Book of Now, 2017 Readers’ Favorite 5 Star reviews for Breaking the Glass Slipper, and The Book of Now. 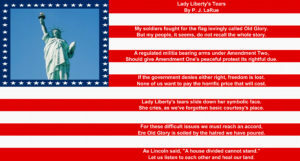 My soldiers fought for the flag lovingly called Old Glory. But my people, it seems, do not recall the whole story. Should give Amendment One’s peaceful protest its rightful due. If the government denies either right, freedom is lost. None of us want to pay the horrific price that will cost. 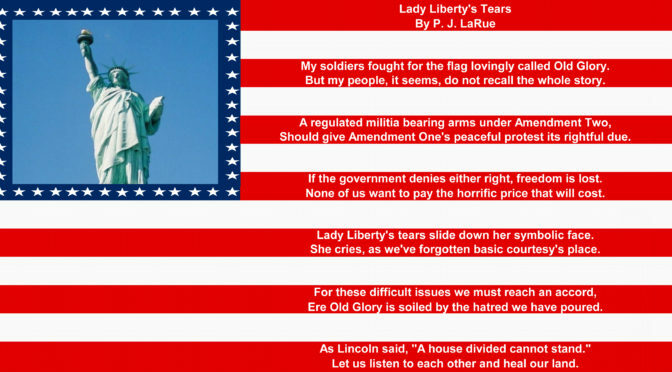 Lady Liberty’s tears slide down her symbolic face. She cries, as we’ve forgotten basic courtesy’s place. 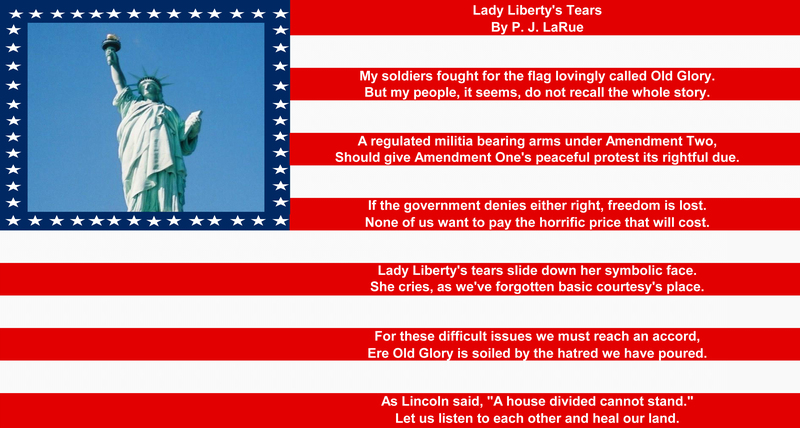 Ere Old Glory is soiled by the hatred we have poured. Let us listen to each other and heal our land. First, let me say that I do not profess to know the answers. I do not believe my thoughts should overwhelm another person’s thoughts. I do believe that we, as a Nation, need to rediscover the art of LISTENING to both sides of an issue, deciding what we believe and then communicating with our Congressional representatives. Arguing with each other online or through any other medium is not solving our problems. We are tearing each other apart and causing more damage to our Nation than any terrorist could hope to cause. I hope this post motivates the silent majority of people to contact their Congressional Representatives. It is not my intention to provoke people into arguing with each other, but to encourage thoughtful listening and reasonable conversation. When applying this to current events, I do not believe that any politician should try to force the NFL players to stand during the National Anthem. To do so, is a violation of Amendment One, which our soldiers fought and died to defend. Preventing peaceful protest is disrespectful to everything they and their families sacrificed. However, Amendment One does not prevent the NFL from instructing the players to protest on their own time and in street clothes rather than their uniforms. How the NFL chooses to respond is up to them. Then we have a right to choose whether to watch NFL games or not. We as citizens should also not remove another’s right to peacefully protest. End of story. Stop letting the media manipulate you. I believe that individuals do not need military style weapons such as AK-47s or AR-15s because the innocent people who end up being targets of terrorists and crazies do not have a chance to defend themselves. I do understand some of the reasons gun rights activists are concerned, and I believe we will not reach a compromise without a change in behavior by both the proponents and opponents of gun control laws. The first reason often provided is that if the law abiding citizens were to give up their AK-47s and AR-15s, the criminals will not. I agree with that. However, to look at the opposing thought process, how many gangs and/or criminals are using these weapons in mass shootings, which are defined as four or more people? Well, it may be quite a few, because the definition of mass shootings varies between at least four people injured to at least four people killed according to politifact.com. There are nearly 34,000 gun deaths in the United States each year lending credence to both sides of the issue. Some people want their weapons for self defense. Others believe that if fewer weapons were available, fewer deaths would occur. According to the BradyCampaign.org website, 11,564 of these deaths are murders and 21,037 are suicides. What we do not know is how many of these deaths would not have occurred anyway if guns weren’t available. That leads to the second reason gun owners often state. People will find a way to kill others. Unfortunately, they are right, perhaps not as many, but some will still be murdered. One horrifying example occurred the same week as the Las Vegas massacre. Six toddlers and a teacher were murdered at a childcare center in Brazil by a security guard who had been fired. Finally, this gruesome murder did not receive the same media attention that mass shootings do. Because it didn’t occur in the United States? Was it because it supports gun owners’ statements? Perhaps it was because the media didn’t benefit by airing it. Why? I don’t know. In closing, my “side” is my opinion. However, if I check news sources reports from both sides of the issues, perhaps I will learn more. The media has a vested interest in keeping us divided. It’s all about the ratings. Comment if you like, but please, no name calling or fighting with each other. Comments will be screened, and I reserve the right to not post any that call names, insult others or generally spread ill will. I hope this post helps us learn to communicate and to cut through the barriers that are preventing solutions. Let’s dry Lady Liberty’s Tears. 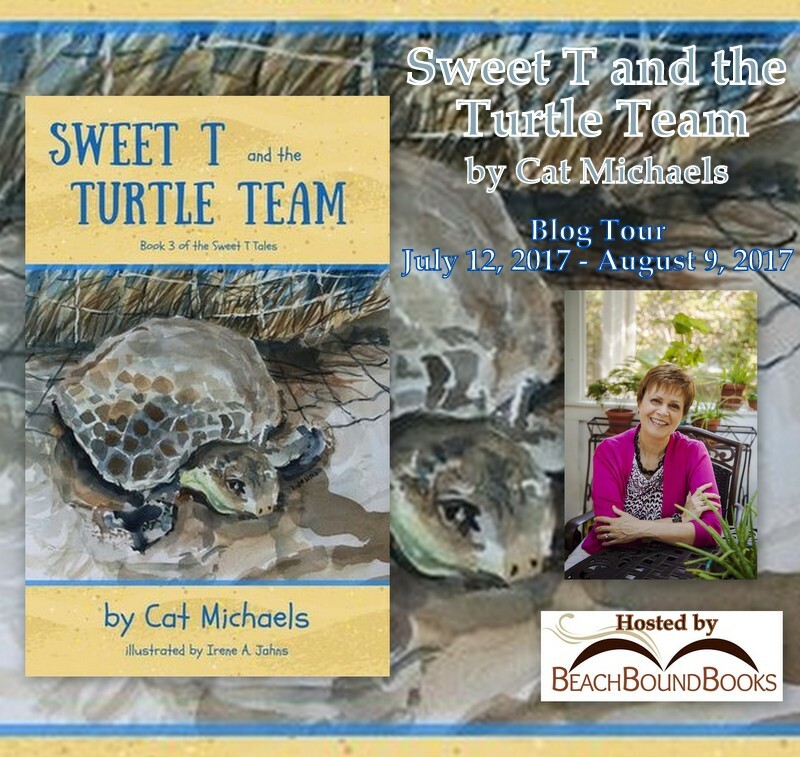 A big thank you to Stacie Theis at BeachBoundBooks who put together the materials for this post and coordinated the blog tour for Sweet T and the Turtle Team. 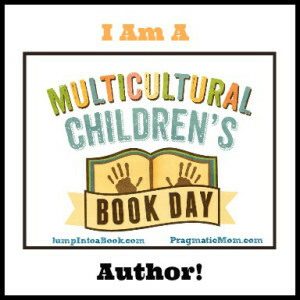 I’m happy to join the fun and to present my Sweet T and the Turtle Team book review. 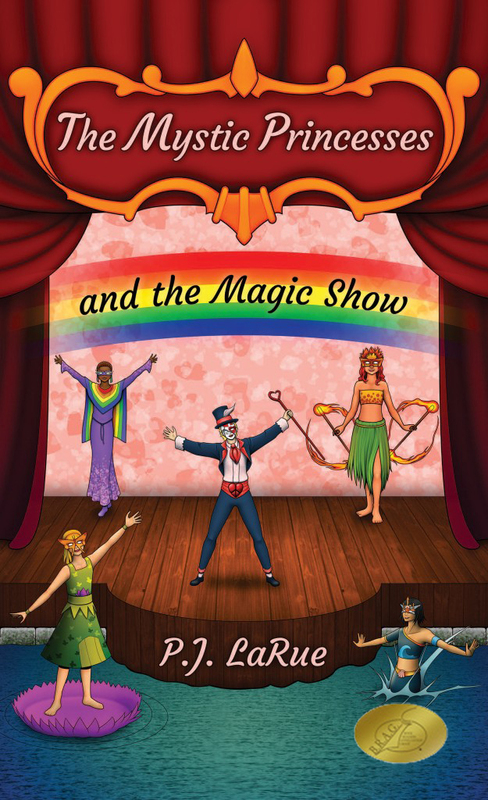 This children’s book is written by Cat Michaels and beautifully illustrated by Irene A. Johns. The tour will run from July 12 – August 9, 2017. My Review: I have to say right off that this Sweet T and the Turtle Team book review will be one of the easiest I’ve ever written. This children’s book by Cat Michaels appeals to me on many levels! Ms. Michaels gently weaves life lessons as the story unfolds. 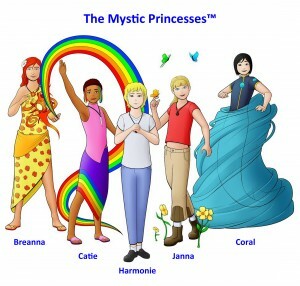 These lessons include environmental consciousness, acceptance, bullying, and helping others overcome issues are deftly covered. 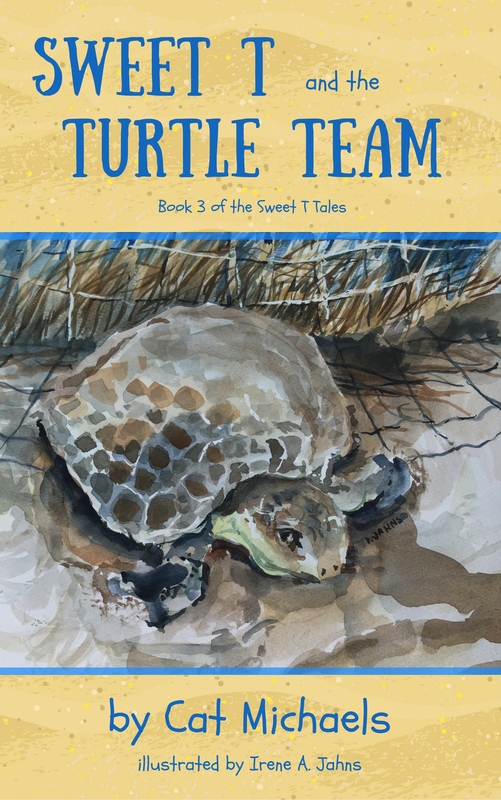 Although Sweet T and the Turtle Team is the 3rd book in the series, each book can be read independently. In this book, Tara who is nicknamed Sweet T, is vacationing at her Great Aunt Mae’s home in Gull Island. She is lonely because she hasn’t made friends yet. The other children make fun of her accent. And what is up with the neighbor, Billy, who is sometimes mean to her? Sweet T learns that Billy has a secret, and hasn’t shared it with her yet. Will they ever truly become friends so that Billy is comfortable enough to confide? 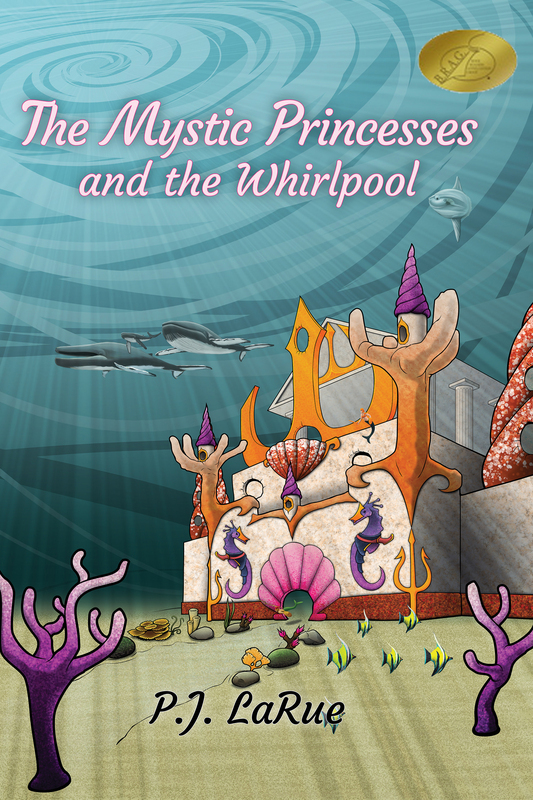 The book’s treasures don’t end when the charming and educational story is finished. Ms. Michaels added discussion questions for the readers to answer to ensure they understood and retained the story. She also added a glossary of abbreviations used when texting, a glossary of story related terms and a photo gallery of a real sea turtle nest and hatchlings. After “I Do!” A Marriage Map is a finalist in the non-fiction category! It’s finally voting time – indieBRAG 2017 Cover Contest. 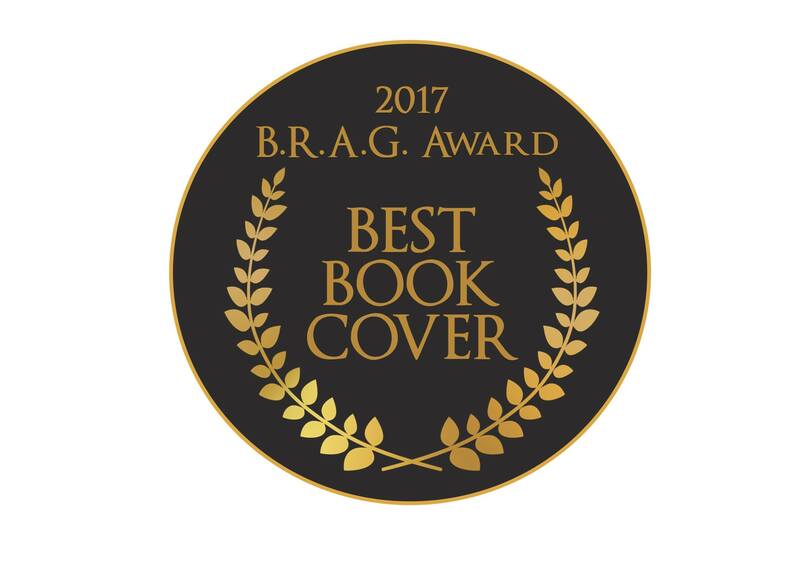 I’d be honored and humbled if you would vote just once for my cover from July 1, 2017 through July 28, 2017. If you’d like to vote for After “I Do!” please click here. 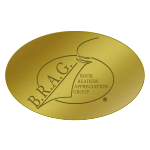 May I offer an excerpt from by book as thanks for you stopping by? I didn’t have a childhood filled with innocence or a doting father whom I could wrap around my little finger. He didn’t tell me how beautiful I was, and he didn’t shield me from the world; in fact, he was the world from which I needed to be shielded, but wasn’t. My father was an alcoholic who sometimes beat my mother. Anger was the first emotion to surface in our family because we lived in a household founded on fights. I didn’t learn to express my emotions with maturity because I didn’t grow up in a loving, calm and nurturing environment. And because my parents fought first, and sometimes apologized later, I learned to argue rather than discuss disagreements. This disturbing family dynamic made me distrust men to the point that I’d planned my escape route long before I had a serious boyfriend or fiancé. I had dreams of happily ever after, but that was all they were: Dreams. I thought they were a fairy tale, not reality. But when my mom left my dad and married my step-father, I saw a couple where respect, admiration and love were the key ingredients. Through watching their love grow, I learned that relationships could be happy, and marriages could last. I began to believe “and they lived happily ever after” wasn’t just a fairy tale ending after all. I began to open up to the idea that not all men were bad, but my dad’s inappropriate behavior was the yardstick in which I measured the characteristics of the men I dated. I didn’t date bad boys. Guys had to kind and respectful before I would date them. If they reminded me of my dad in any way, I didn’t date them. Although you, the reader, needed to know this about me, dysfunctional relationships aren’t what this book is about. I’ve written about the keys to communication that will help relationships survive because I would love for you to have a relationship as happy as ours. The inspiration for After “I Do!” A Marriage Map? After “I Do!” A Marriage Map was the result of a blog post called “How I Escaped the Domestic Violence Cycle, which can be read here. I’d love your vote for After “IDo!” so I can win this badge and other contest prizes. Thank you! 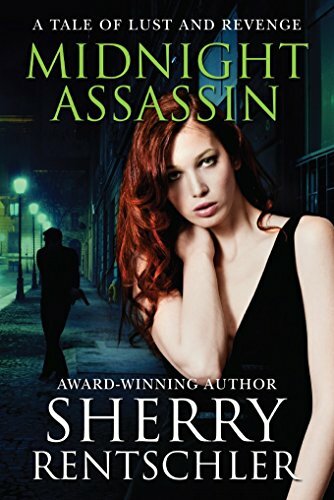 When I first read Midnight Assassin: A Tale of Lust and Revenge, I thought it was a great series starter and wanted the next book immediately. 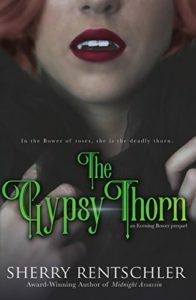 The author, Sherry Rentschler, just released The Gypsy Thorn, which I bought directly from her at a book fair. 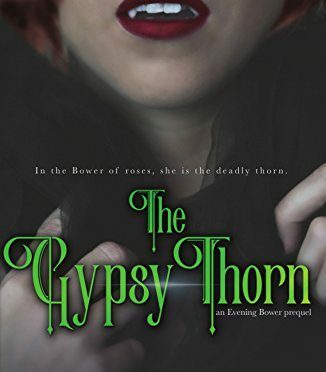 The Gypsy Thorn provides the “back story” to Midnight Assassin and introduces other characters that will appear later in the series. I read The Gypsy Thorn in one afternoon and now have to suffer withdrawals while waiting for the next book in the series to be released. I’m not going to recap “the story” here in my review because I’d rather use the space to tell you to go buy both books. Why are you still reading? Go now. For those of you still not sold, I was already a vampire fan before starting this new series. However, if I weren’t, I would have been “converted” after Drahomira’s bite. She is strong, resilient, beautiful and smart – my kind of lead female character. 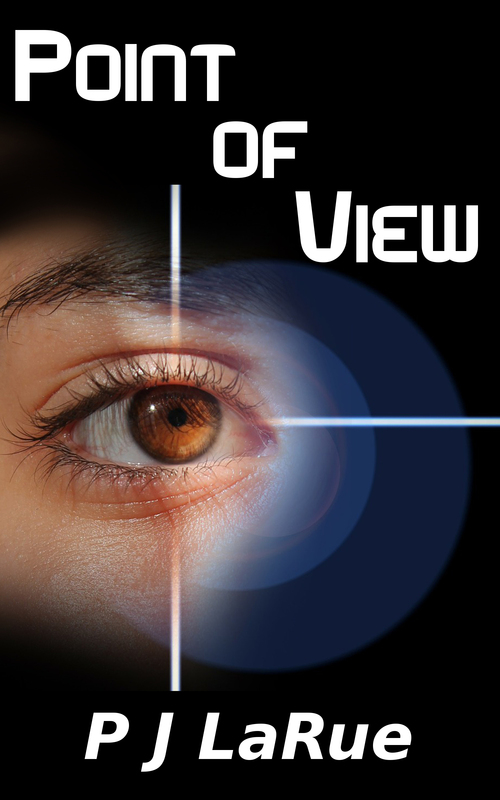 Couple that with Ms. Rentschler’s descriptive storytelling and readers are in for a treat. I highly recommend reading Midnight Assassin before The Gypsy Thorn. You will love them both! (Where is the happy face emoji with vampire fangs when you need it?) It was quite fun talking to Ms. Rentschler at the book fair because I found out The Gypsy Thorn is a prequel to Time and Blood. I’m counting the days, but I won’t be holding my breath though because I would need Drahomira to make me into a real vampire to survive until October. Forever your fan, Ms. Rentschler! ‘Til we meet again. Update: This post originally reported that the next book would be called The Evening Bower. 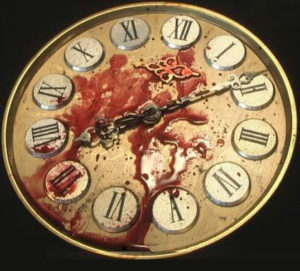 It is actually called Time and Blood, #1 in the Evening Bower series, and has been changed in the post.